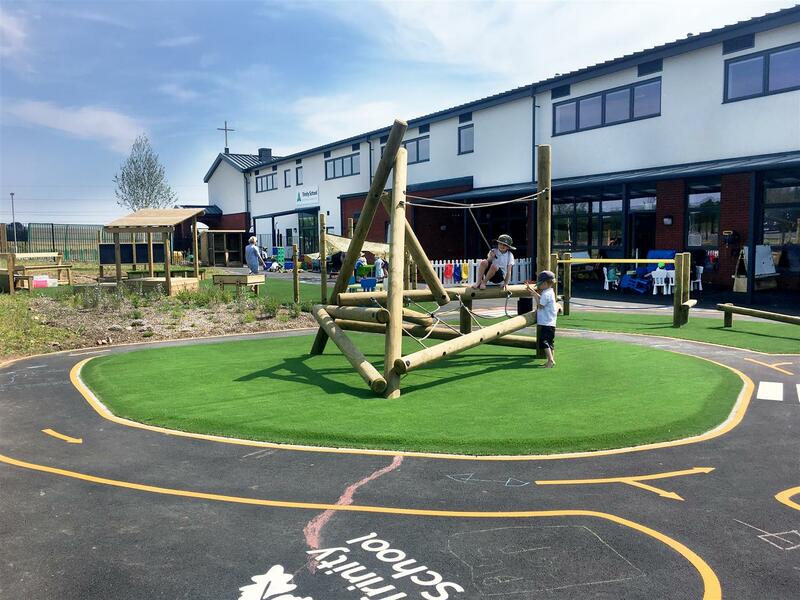 Pentagon Play's Playground Consultant, Becky Hazell, met with the Headteacher at Trinity CofE VA Primary School and collectively formulated a plan for the school's Early Years and Key Stage 1 outdoor play areas. Preparing and implementing a large playground for Trinity CofE VA Primary School felt both exhilarating and challenging. We were able to install; an aesthetically pleasing, visually stimulating and outdoor curriculum-focused nursery and reception garden, and an outdoor infant area. Here is a snapshot of the overhaul of the outdoor areas at Trinity CofE VA Primary School and Pentagon Play’s journey from planning to execution. 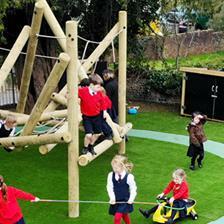 At Pentagon Play we recognise that the playground is critical during the foundation stages of learning. We feel honoured to have installed an early years playground at Trinity CofE VA Primary School that is advantageous in supporting physical development. 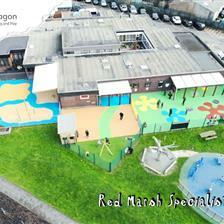 The early year's outdoor play area was divided into different zones specifically targeting various types of play. The first zone we created was for active play, this was an important fragment of the playground at Trinity CofE VA Primary School as it inspires children to get fit and move. By installing targeted playground equipment, children can progress and develop their motor skills and refine their balance and coordination, whilst simultaneously building muscle strength. This region is particularly advantageous as it encourages children to take safe risks. Our striking and visually stimulating playground markings serve a dual purpose. They are both colourful and aid learning. The children at Trinity CofE Primary School can use these resources to practise phonics, literacy and numeracy while developing their understanding of the world. When the children use these more than one part of the brain is stimulated. One-part concentrates on physical growth and movement, whilst the other focuses on learning and recall, bringing the fun back into learning. They say a picture paints a thousand words and here is one to show just how beautifully we transformed the play areas into zones of learning and discovery. You can take a look at our full range of Playground Markings here. The addition of a bespoke outdoor Amphitheatre at Trinity CofE VA Primary School delivers a perfect place for children to express creativity. 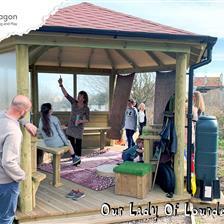 It can also be utilised as an outdoor learning space with shelter. To create extra seating, we added artificial grass in the centre. At Pentagon Play, we like to go the extra mile for our customers, therefore we personalised our standard design to have an increased height along the back upright, to meet the school’s requirements. We also fitted a lovely Bespoke Performance Stage with chalkboards to encourage expressive arts and design, along with developing children's fine motor skills and handwriting. This can be used for outdoor teaching and provides children with the freedom to fully express themselves using non-prescriptive play further developing their self-confidence, communication and language skills. We included an imaginative and creative zone for the children at Trinity CofE VA Primary School to encourage the use of their imagination. It was important that we formed a zone with apparatus intended to give the children the opportunity to completely express themselves and to develop their confidence. It’s a welcoming setting which encourages role play, taking turns and active listening skills that are all important for adulthood. 2 medium self-selecting stores: particularly beneficial for child-led play. How we collect and process sensory information such as; look, touch, feel, smell, and sound plays a fundamental role in understanding the world around us. We fitted an assortment of messy play equipment at Trinity CofE VA Primary School that endorses sensory development and encourages children in the foundation stages to engage in messy play. It also has the supplementary benefit of social, language and communication growth as well as the development of interpersonal skills and teamwork. At Trinity CofE VA Primary School, the play equipment that we installed for physical development was carefully selected to encourage the development of gross motor skills. Pentagon Play appreciate how important the advancement of motor skills are for children and that these are integral skills essential to complete everyday tasks. We installed a series of equipment which would be beneficial in refining children’s muscle strength, balance and coordination. These also inspire children to progress in lifelong skills which can be applied to the real world, such as; communication, turn taking, lead and follow, co-operation and teamwork. The great thing about this zone is that the teachers at Trinity CofE Primary can use the above apparatus as part of their PE lessons. "I have absolutely loved working alongside Owen and Sarah to create their dream outdoor space for the children at Trinity. Their passion, experience and enthusiasm on how they want their children to learn was really exciting to create a design for. It has been so much fun to be a part of the journey, developing their lovely new provision at Trinity C of E and going back to visit and seeing the children enjoying the space was just amazing!! I know the outdoor area will be very much loved by the staff and children now and in the future and know it will be the source of lots of wonderful and memorable moments for the children throughout their time at Primary School. " For more information on how we could convert your school’s outdoor play area Contact Us through the website and we will be in touch to arrange a free consultation.